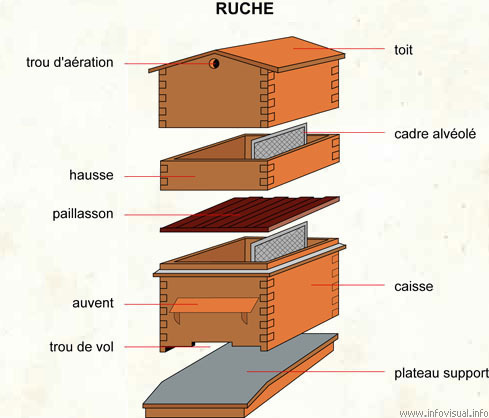 Ruche - Dictionnaire Visuel - Copyright © 2005-2016 - Tous droits réservés. [img]https://infovisual.info//storage/app/media/02/img_fr/043 Ruche.jpg[/img] [url=https://infovisual.info/fr][/url] - [url=http://www.infovisual.info/]Dictionnaire Visuel[/url] - Copyright © 2005-2016 - Tous droits réservés. A honeycomb is a mass of hexagonal wax cells built by honey bees in their nests to contain their larvae and stores of honey and pollen. Beekeepers may remove the entire honeycomb to harvest honey. Honey bees consume about 8.4 pounds of honey to secrete one pound of wax, so it makes economic sense to return the wax to the hive after harvesting the honey, commonly called "pulling honey" or "robbing the bees" by beekeepers. The structure of the comb may be left basically intact when honey is extracted from it by uncapping and spinning in a centrifugal machine the honey extractor. Fresh, new comb is sometimes sold and used intact as comb honey, especially if the honey is being spread on bread rather than used in cooking or to sweeten tea. Broodcomb becomes dark over time, because of the cocoons embedded in the cells and the tracking of many feet, called travel stain by beekeepers when seen on frames of comb honey. Honeycomb in the "supers" that are not allowed to be used for brood stays light coloured. Numerous wasps, especially polistinae and vespinae, construct hexagonal prism packed combs made of paper instead of wax; and in some species (like Brachygastra mellifica), honey is stored in the nest, thus technically forming a paper honeycomb. However, the term "honeycomb" is not often used for such structures. The axes of honeycomb cells are always quasi-horizontal, and the non-angled rows of honeycomb cells are always horizontally (not vertically) aligned. Thus, each cell has two vertical walls, with "floors" and "ceilings" composed of two angled walls. The cells slope slightly upwards, between 9 and 14 degrees, towards the open ends. There are two possible explanations for the reason that honeycomb is composed of hexagons, rather than any other shape. One, given by Jan Brozek, is that the hexagon tiles the plane with minimal surface area. Thus a hexagonal structure uses the least material to create a lattice of cells within a given volume. Another, given by D'Arcy Wentworth Thompson, is that the shape simply results from the process of individual bees putting cells together: somewhat analogous to the boundary shapes created in a field of soap bubbles. In support of this he notes that queen cells, which are constructed singly, are irregular and lumpy with no apparent attempt at efficiency. The closed ends of the honeycomb cells are also an example of geometric efficiency, albeit three-dimensional and little-noticed. The ends are trihedral (i.e., composed of three planes) pyramidal in shape, with the dihedral angles of all adjacent surfaces measuring 120°, the angle that minimizes surface area for a given volume. Beekeeping is the practice of humans maintenance of honeybee colonies in hives. A beekeeper may keep bees in order to collect honey. Early forms of honey collecting entailed the destruction of the entire colony when the honey was harvested. The wild hive was crudely broken into, using smoke to suppress the bees, the honeycombs were torn out and smashed up, along with the eggs, larvae and honey they contained. The liquid honey from the destroyed brood nest was crudely strained through a sieve or basket. This was destructive and unhygienic but for hunter-gatherer societies this did not matter, since the honey was generally consumed immediately and there were always more wild colonies to exploit. However, in settled societies, the destruction of the bee colony meant the loss of a valuable resource; this drawback persisted until the 19th Century, which made beekeeping both inefficient and something of a 'stop and start' activity. There could be no continuity of production and no possibility of selective breeding, since each bee colony was destroyed at harvest time, along with its precious queen. During the medieval period abbeys and monasteries were centers of beekeeping since beeswax was highly prized for candles and fermented honey was used to make alcoholic mead in areas of Europe where vines would not grow.